The evolution of Sunship can be traced back to a number of collaborations beginning with that of bassist Richard Anstey and myself in the Al Neil Trio during the latter half of the 1960s and the Al Neil Jazz Probe in 1972. 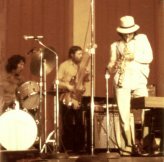 In 1971, we formed a trio with guitarist Alan Sharpe, and called it The New Atlantis Houseband. 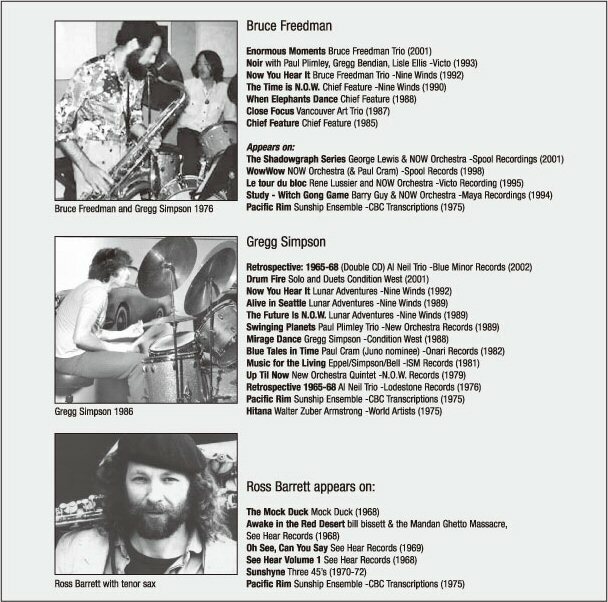 During the same period in the early 1970s, tenor sax player, Bruce Freedman moved to Vancouver from Los Angeles and began playing in various small ensembles along with bassist Clyde Reed, also a recent emigrant to Canada from Vancouver, Washington. Flautist, saxophonist and keyboard player, Ross Barrett, had already been playing with Richard Anstey and me in a quartet, which also included the Montreal-born pianist Rick Kitaeff, whose music the group would eventually play. 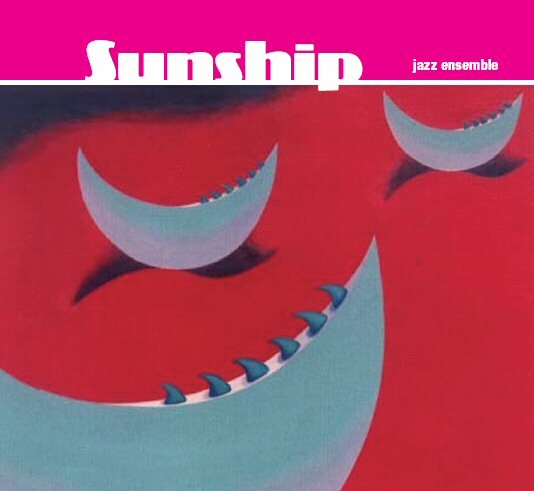 The Sunship Ensemble, which formed in 1974, was a group in tune with its times. The end of the Vietnam War gave birth to a new optimism: The New Age had begun and this manifested itself in a new pan-global musical consciousness. A whole new generation of creative musicians in Vancouver was coming of age. The incorporation of world music influences, drawn from various cultures, was evident in many celebrated jazz/fusion groups of the early 1970s, such as McCoy Tyner’s sextet, Weather Report, Chick Corea’s Return to Forever, the Mahavishnu Orchestra, Miles Davis and others. A second wave of Latin American musicians like Airto, Flora Purim and Santana brought jazz and rock closer together than ever. But Sunship also incorporated even more extended free form improvisations than many of the Latin or funk-tinged groups of the time. The ensemble included Ross Barrett (tenor sax, flute and keyboards), Bruce Freedman (tenor sax), Richard Anstey (soprano sax), Alan Sharpe (guitar), Clyde Reed (bass) and Gregg Simpson (drums). Sunship played concerts at the Western Front and at the opening of the Granville Mall in Vancouver, plus opening for pianist Keith Jarrett, at the Commodore Ballroom on June 11, 1974. Bob Smith in The Vancouver Sun wrote, "a double-header including pianist Keith Jarrett and resident quintet, the Sunship Ensemble. Putting it mildly it was a mind-blower, and the 800 who attended gave more than a glimmering of hope for jazz in this city." Guitarist, Bob Bell, who attended that concert, remembers the group’s music as a revelation to him, as not many other similar fusion ensembles were active in Vancouver at the time, although two groups, Skywalk and Pacific Salt were to emerge not long after. While international in outlook, the group played a regionally-based music, which grew out of the west coast, rainforest environment, but also incorporated exotic input from the music of Asia, Africa, and Latin America. The selections on this CD reflect the multi-directional approach of the group, with free jazz material alternating with the Afro-Latin influences of the times. 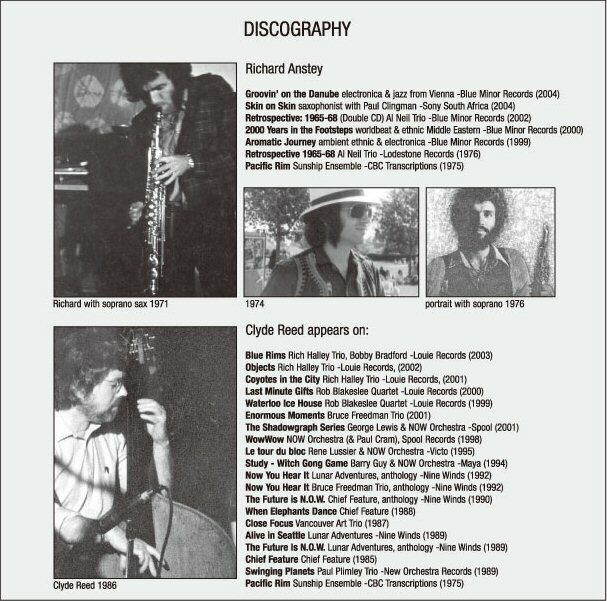 Some of the material for the CD was previously released on a 1975 CBC Transcription Recordings LP, entitled Pacific Rim (RCI 428), produced by George Laverock. One piece, entitled Great Wall of China, was arranged from a traditional Chinese melody by Rick Kitaeff whose group in Japan at the time, Electric Ninja, shared the album with the Sunship Ensemble. To reflect the international theme, the groups each did a composition by their counterpart across the Pacific. Sunship disbanded at the end of 1975, but in the late 1970s I went on to form the New Orchestra Workshop, which eventually included Sunship members, Bruce Freedman and Clyde Reed who still play in the NOW Orchestra today. In this sense, the Sunship Ensemble followed the pioneering efforts of the Al Neil Trio in the 1960s, to become the next step in creating a wonderful era of improvised music in Vancouver, which continues until the present time. CBC Album Notes (RCI 428) Recorded December 5, 1974 in Vancouver, B.C. Pacific Rim is a unique endeavour, uniting a Canadian and a Japanese improvisational ensemble, each playing their own, and the other group’s original compositions, based on thematic material from each of the four Pacific continental regions. Guitarist Alan Sharpe leads the Sunship Ensemble of Vancouver, while the Electric Ninja group is headed by ex-Montreal pianist-composer Rick Kitaeff, who after traveling extensively in Asia, Indonesia and the Orient, taught literature and communications at Kobe University in Kyoto, Japan and now teaches at the University of Seattle in Washington. One of the more interesting aspects of the contemporary music scene is the breakdown of many of the artificially created barriers that divide music. Many musicians are finding that traditional categories such as “jazz”, “pop”, “avant garde”, etc., restrictive and self-limiting, and are drawing more freely on musical material from all sources, and in particular from the Third World Cultures. As Rick Kitaeff sees it: “The emphasis is now on fusion- of rock, jazz, classical, Afro-Latin – and it won’t be long before the so-called “melting pot” of North American culture fully absorbs from the Third World as it has from Europe. “…The musical materials of all the pieces were drawn mainly from the Pacific basin cultures. “Atlantis Rising” represents, for the Sunship group, a starting point of European-based modal structure, dissolving into free-flowing samba-flavoured drum and tenor solos. The titles of the Sunship compositions Mesopotamia” and “Inca” reflect their inherent sympathies with ancient, mythic cultures and present a contrast between the dense, rich textures of the former and the deft, syncopated guitar punctuation by composer Alan Sharpe in the latter. “Great Wall of China” is another piece having a background of performances with electronic elements. Sunship’s arrangement of the piece is a lush, multi-layered structure, precisely articulated to give novel harmonic proportions to the Oriental pentatonic scale. Both Electric Ninja and Sunship, as represented by their efforts on this recording, have tried to return the new music movement to its spiritual roots by intercultural diversification of their musical materials. To say that they play “earth music”, however, is not to make any claims of exclusiveness in the orientation towards universality, but simply to indicate that all music is ultimately ethnic. which last year invested $27.4 million in music throughout Canada. qui a investi 27,4 millions de dollars l'an dernier dans la musique à travers le Canada.